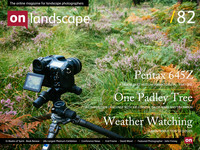 Berkshire based photographer and fundraiser. Nevertheless I kept my eye on Pentax, it's demise and subsequent merger with Hoya and then purchase by Ricoh in 2011. I have always had a soft spot for the brand and several years ago purchased a 67ii with an assortment of lenses. Sadly it didn't quite bite me as it had back in 2003. The quality of digital had moved on and I frankly I had become seduced by the ease of the digital workflow. Rumours circulated that Pentax/Hoya/Ricoh would be introducing a low priced (relatively) entry into the full frame market. This quickly moved to being a medium format sensor, formally the exclusive realm of medium format backs. Intrigued I followed the story for 5 years until 2010 when the the 645D was launched. The online world, particularly landscape, portrait and studio photographers were significantly interested in this development. Did Pentax finally have a good value winner? Not exactly.